Self-opinionated Garry Schofield is up to his old tricks - slagging off all and sundry involved in Super League when he thinks fit. 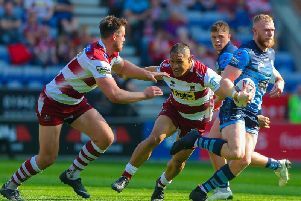 Two of his latest targets are Saints’ head coach Keiron Cunningham and his Warrington Wolves counterpart, Tony Smith, who have both made an inauspicious start to the season. But Schofield - a former Great Britain captain - comes down hard on what he describes the “short-sighted nonsense” of both coaches in dropping young half backs Danny Richardson and Declan Patton. The views of the ex-Hull FC, Leeds, Balmain Tigers, Western Suburbs and Huddersfield centre/stand-off, which are published in this week’s Rugby Leaguer and League Express, cannot be entirely ignored due to his outstanding past playing record - even though when he turned to management he didn’t last too long in charge. He only managed a mere 13 games as Huddersfield’s supremo and just five with Barrow Raiders. They will no doubt remind him pronto if that turns out to be the case.